What I'm going to do with my lotto winnings. It's in a ski area in Idaho. 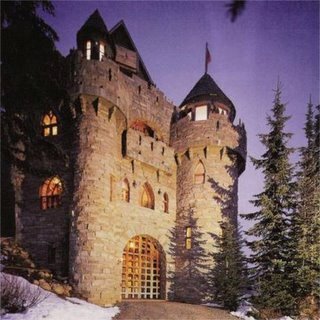 Only $2.25 million from Castle Magic. And then maybe a beach cabin. Ever wonder what Charlie Brown is doing now that his comic strip gig is over? I am Mr. Charles Brown, a Canadian Attorney based in Manchester, United Kingdom and the personal attorney to Late Mr. Mark Michelle a citizen of France. Late Mr. Mark Michelle was a private oil consultant/ contractor with the Shell Petroleum Development Company in Saudi Arabia before his death, hereinafter shall be referred to as my client. On the 21st day of April 2000, my client and his wife along with their three children were involved in a ghastly motor accident. All occupants in the vehicle unfortunately lost their lives. Since then, I have made several enquiries from the French embassies to locate his next of kin or any of his extended relatives, but all to no avail. My client made a deposit in a Security and Finance institution valued presently at $12,000,000.00 (Twelve Million United States Dollars) and the company has issued me an official notification to provide his next of kin or beneficiary by will, therwise the account will be confiscated within the next sixty (60) working days. Since I have been unsuccessful in locating any of my late client's relatives for three (3) years now, I now seek your consent to permit me present you as the next of kin/ beneficiary of my late client so that the proceeds of this account can be paid to you. I am willing to offer you 35% of the total sum as a reward for your efforts in assisting me, while I take 50% of the total sum. The 5% of the fund will serve as reimbursement of expenses both local and international any of us will make in the course of this transaction. While we shall collectively donate the remaining balance of 10% to Tsunami Relief Organisations. Consider this proposal and get back to me as soon as possible so that I furnish you with more details on how we shall proceed. I could really use 35% of $12,000,000.00, and I'd sure like to help out "Tsunami Relief Organisations." Maybe I'll write back. For the next installement in "The Art of the Nigerian Scam," click here. I think Pandora.com has to be about the coolest thing I've seen online this year. It basically creates custom radio stations tailored to your musical tastes. You tell it what music you like, and it plays it, along with other stuff it thinks is like the music you like. Then you tell it how it did, and it adjusts accordingly. Last month I attended Jive Train's last ever performance at Antone's. Well, it turns out that forever isn't nearly as long as I thought. From what I've heard, despite the breakup, Jive Train will still be seeing each other on the sly. It seems that they love their Antone's crowd so much that they'll be getting back together once every couple months just for us. Look for them to be back March 18, 2006. Some of you may recall my post from way back in November of 2004 about 9 Station Drive and Hayes Carll at Courville's. It was a great show, but poorly attended. Mr. Carll was supposed to be back in October of last year (if I have my dates straight), but the show was rained out. Actually, I think it was a bit more than the rain. The show was scheduled for a week or two after Rita blew through. I think Courville's finally got their power back the day before the show had been scheduled to go on, but most people weren't back in town yet and Big Rich Courville & Co. were far too busy feeding the clean up crews down at Ford Park to do the show. And besides, by that time the show had already been postponed. Anyway, Carll finally found his way back to Courville's last night. Although I've never seen anything at Courville's promoted anywhere but here, it was a very well attended show. The doors were supposed to open at 7:00, and when I got there at about 7:01, most of the tables were already gone. This time it was $30 per person--up from $15 for Carll's 2004 show--but that included the buffet and this time Carll brought a full band. The food was good, but 9 Station Drive was better, and Hayes Carll was better still. Great stage presence, really good song writing, good singing, and all that kind of stuff. If you like guys who play guitar and sing songs that aren't stupid or sappy, you might like him. I know I did. Again. Upcoming shows at Courville's include Ray Wylie Hubbard on February 16 and Fred Eaglesmith on March 22. Ray Wylie Hubbard put on a great show at Courville's last August and has earned Wang Chi's Five Pancake Rating as a live performer. Don't miss it. I haven't seen Fred Eaglesmith (or even heard his music), but whoever books the bands for Courville's seems to know what he's doing. I expect I'll post something after the show.